Required to qualify, the French pairing formed by Alexandre Robinot and Joe Seyfried won the Men’s Doubles title at the 2018 ITTF Challenge Seamaster Nigeria Open in Lagos on the afternoon of Sunday 12th August. At the final hurdle they beat the combination of Hungary’s Tamas Lakatos and Finland's Benedek Olah, the no.5 seeds, to secure the title (11-3, 11-7, 5-11, 11-6). Alexandre Robinot and Joe Seyfried secured the opening game with a degree of ease; they were the first to seize the initiative and the better pair over the table, near the net, so vital in doubles play. The modern day so-called “banana” return of service, the forearm approaching the vertical, the wrist relaxed and circumnavigating the ball to produce a cocktail of sidespin and top spin, was the favoured ploy. Success for the French pair and never really troubled in the opening game, it was very little different in the second against a pair who no doubt conversed in Hungarian; as the surname suggests, Benedek Olah has Hungarian ancestry and spends much of his time in Budapest under the tutelage of Peter Aranyosi. Szandra Pergel, sitting courtside in the role of coach had no linguistic difficulties in administering advice! Heeding the advice Tamas Lakatos and Benedek Olah secured the third game but in the fourth they trailed 5-2; they called “Time Out”. A three point gap was reduced to one point at 6-5 but at 10-6 Alexandre Robinot and Joe Seyfried held four match points, they converted at the first attempt. 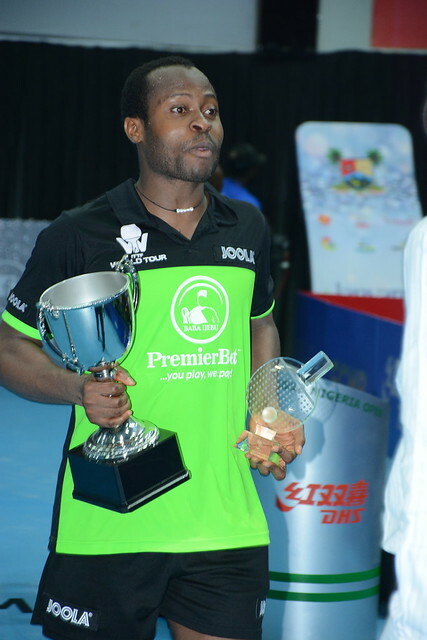 Success for France and success for the second consecutive year at the 2018 ITTF Challenge Seamaster Nigeria Open; in 2017 Antoine Hachard and Gregoire Jean claimed the title beating Romania’s Alexandru Cazacu and Rares Sipos at the final hurdle.